At 2pm PST I will be streaming my wedding makeup trial. 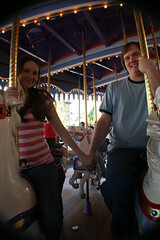 This entry was posted in Journal, Online and tagged engagement, wedding on April 30, 2008 by Shannon. We got our engagement pictures taken this weekend. 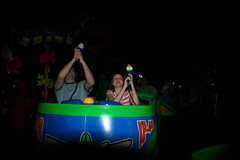 My sister and her friend took them at Disneyland. You can see the whole set on flickr. 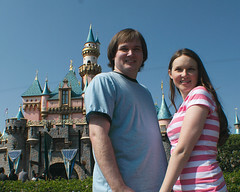 This entry was posted in Journal, Online and tagged engagement, wedding on April 22, 2008 by Shannon. I’ve got my wedding dress! I found it yesterday. 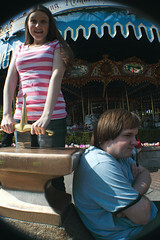 I’m posting it only on LJ friends only so Jerrod won’t see it! I’m having a bit of post-dress anxiety, especially since it was the first store I went to, but I think I picked the right one. My two sisters and my mom and my sister’s friend all liked it best, and under the lace is dotted tulle so the lace looks dotted. My grandmother’s dress was dotted swiss. This entry was posted in Journal, Online and tagged engagement, wedding on April 13, 2008 by Shannon. This week we were finally able to set a date for our wedding! 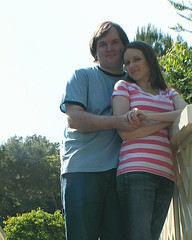 This entry was posted in Journal and tagged engagement, wedding on April 4, 2008 by Shannon. If you read our engagement story, you’ll know that Jerrod got a brand new iPhone. One of the first decisions I made after we were engaged was that I wanted an iPhone too. I spent the weekend deciding if I wanted an iPhone. I would eventually be moving to his cell phone plan anyway, so the question was iPhone or some other phone on AT&T. We stopped into an AT&T store to look at what phones they had, and nothing else was really too interesting. Tuesday night while I was babysitting, I finally realized that I wanted an iPhone. I previously had a pink ipod mini(first gen) and an 80gb iPod with video, and my phone was a windows mobile device. I still keep my mini around for the car, and usually listen to my big iPod while working and whatnot, it having all my podcasts and audiobooks and a big music selection on it. I figured I could basically combine my phone and my ipod mini’s functions into one gadget, with double the capacity of my mini. I had already found a pink iPhone skin and case that I liked. We ordered the skin and case that night and Thursday night Jerrod brought me my new iPhone. After talking to my dad to make sure that nothing on my family’s plan got messed up, we activated my new phone. It was so quick and easy, it was honestly less than 20 minutes before I was able to both send and recieve calls AND my iPhone had already synced to my iTunes using the “iPhone” folder I had already made ready. I’ll make it short by saying that I’ve loved my iPhone. 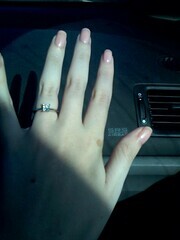 On Saturday we got the email saying that my ring was ready for pickup, so we hurried to Tiffany to pick it up. It looks so much better at my size, and doesn’t fall off(of course). I took a picture of the ring on my hand in the car with my iPhone, and a whole set of pictures later with my ring and iPhone. 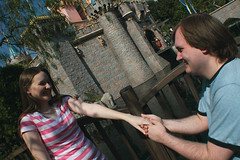 This entry was posted in Journal, Online and tagged engaged, engagement, ring on September 16, 2007 by Shannon. This entry was posted in Online and tagged engaged, engagement, ring on September 15, 2007 by Shannon. Jerrod proposed to me by twitter(what’s twitter?). 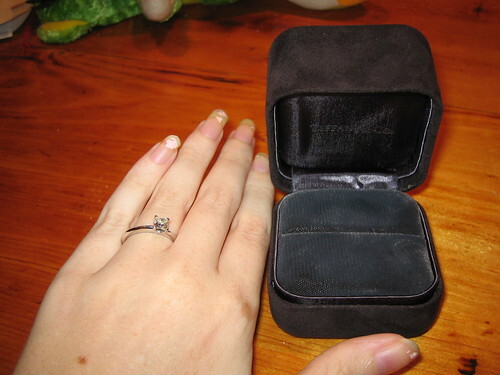 Immediately after I got that twitter (I saw it via IM notification), Jerrod walked in the room with the ring box. I was completely speechless, but managed to actually vocalize the “yes”. I was so excited, I didn’t know what to do! He showed me that he had twittered on his brand new iPhone that I hadn’t seen yet. Jerrod also gave me a Wee Forest Folk figurine of a bride and groom. This entry was posted in Online and tagged engaged, engagement, ring on September 10, 2007 by Shannon. Ignore the nails, focus on the diamond. This entry was posted in Online and tagged engaged, engagement, ring on September 8, 2007 by Shannon.